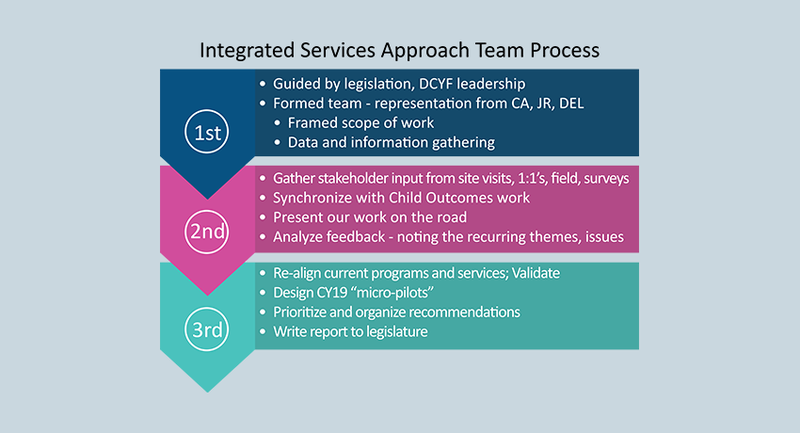 DCYF is charged with creating an integrated approach to service delivery, which will help us re-envision how we deliver our system of services. Our work began by looking at the current services we offer and considering how they contribute to positive outcomes for children, youth, and families. Currently we are working to identify challenges and successes across child welfare, early learning and juvenile justice programs and looking for opportunities to create a cohesive approach, increase efficiencies, and improve family experiences. We are identifying gaps in delivery of and connection to services in order to align the structure of our system with the outcomes we hope to achieve. Our focus is on keeping children and youth from entering, having lengthy involvement with, or reentering child welfare or juvenile justice systems. From this, we plan to develop a better understanding of how the new agency’s programs and services can be best organized into a system to improve the health, education, and resilience of Washington’s children. Here’s a sample of some of the key questions staff have worked to answer over the spring and summer in order to create a strong foundation for our work. What are the existing programs and services available across each of DCYF’s service sectors? What ages of children and youth are served by these programs and services? How frequently do children, youth, and families access these services, and are they available when clients need them? How do people reach necessary services? What is the system of referral for services? How are systems of racial inequity being addressed through DCYF’s programs and services? Which services are informed by research and evidence, and which are promising practices? Where can we achieve stronger outcomes? After defining our ecosystem, our next step was to begin engaging outside partners, stakeholders, and our clients. Doing this helps us to better understand where the common gaps and barriers exist, and where there is space for improvement through realignment of programs. The integrated services approach team first analyzed the feedback that Secretary Hunter received from staff and communities across Washington over the past year. Comments from these conversations have started to coalesce into some clear themes. Here’s an interesting sample. Develop and continuously improve a consistent process to assess needs of children, youth, and families. We believe it is critical to place the voices and experience of children, youth, and families firmly at the center of our thinking when designing the improved system. We will continue to search for and identify gaps in service and program delivery and opportunities for improvement in the next few months. After we reach a firm understanding of the gaps, barriers, opportunities, and successes of our system, we will begin to create plans and processes to re-align our programs and services to improve outcomes. Keep an eye on our website to stay up-to-date on our progress and to find ways to get engaged. And as always, if you have questions, comments, or suggestions about this effort you can email us at oiaa@dcyf.wa.gov.